Daily announcements for the school are located under the ANNOUNCEMENTS tab. and through the scholarship links listed on the "Counselor's Corner" page listed above. Remember to check out all scholarship opportunities, you might be eligible! 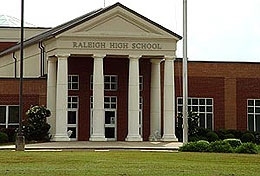 Raleigh High School currently offers several AP (advanced placement) classes. Taking college-level Advanced Placement® courses while in high school can not only give your child a taste of what college is like, it will help him or her stand out at college application time. In addition, scoring well on an AP Exam can get your child college credit, placement out of introductory college courses, or both, potentially saving thousands of dollars in tuition and fees. they shall be considered absent for the entire day. In order to receive credit for a full day's attendance, students should not be checked out before 1:15 p.m.